The man who invented the K-Cup coffee pod almost 20 years ago says he regrets doing so and can't understand the popularity of the products that critics decry as an environmental catastrophe. The man who invented the K-Cup coffee pod almost 20 years ago says he regrets doing so, and he can't understand the popularity of the products that critics decry as an environmental catastrophe. John Sylvan worked at Keurig in the 1990s when he devised a simple product that could create a small mug of coffee out of a plastic pod. Originally aiming it at office workers, Sylvan said he thought the product might have some limited appeal to people who would normally go Starbucks, Dunkin Donuts or other coffee chains in the morning, because now they could get a cup of coffee at work that was cheaper, faster, and no fuss. "That would make it environmentally neutral, because you wouldn't have those Starbucks cups [everywhere]," Sylvan told the CBC's As It Happens in an interview. "The first market was the office coffee service market," he said, adding he is "absolutely mystified" by his product's popularity in homes. Popularity doesn't begin to describe it, as the K-Cup's status is closer to ubiquity. Keurig Green Mountain's annual revenues have climbed to almost $5 billion, up more than five-fold in five years, largely on the back of selling billions of K-Cups every year. Keurig dominates what's come to be a large and growing market. Research firm NPD Group recently estimated that about 40 per cent of Canadian homes have a single-serving coffee machine, and Canadians spent $95 million on them last year. According to a wildly popular ad campaign against the product earlier this year, there are so many discarded K-Cups that if you lined them up it would be enough to circle the earth more than 10 times — and that's just from one year's worth of coffee pods. As the man who invented them, Sylvan might have been pleased with their popularity. But he left the company in 1997, selling his ownership of the product for $50,000. To this day, he still doesn't understand why people like them. "I find them rather expensive," he said. So, how does he make coffee? "I make a pot of coffee in the morning into a thermal carafe," he says. "Before I go to bed … I put the coffee and water in, and when I wake up there's a pot of coffee," he deadpans. "We throw away a lot of coffee but it's so cheap on a per-cup basis." Coffee starts to deteriorate the minute it comes in contact with oxygen, which is why at grocery stores, coffee is typically either sold in a foil bag or an aluminum tin, because both are impervious to air. Plastic doesn't have the same properties, but the K-Cup basically achieves the same thing, while being able to be heated with hot water, by incorporating four different layers and types of plastic. That's problematic for recycling, because the process requires different recyclable materials to be separated into different groups. 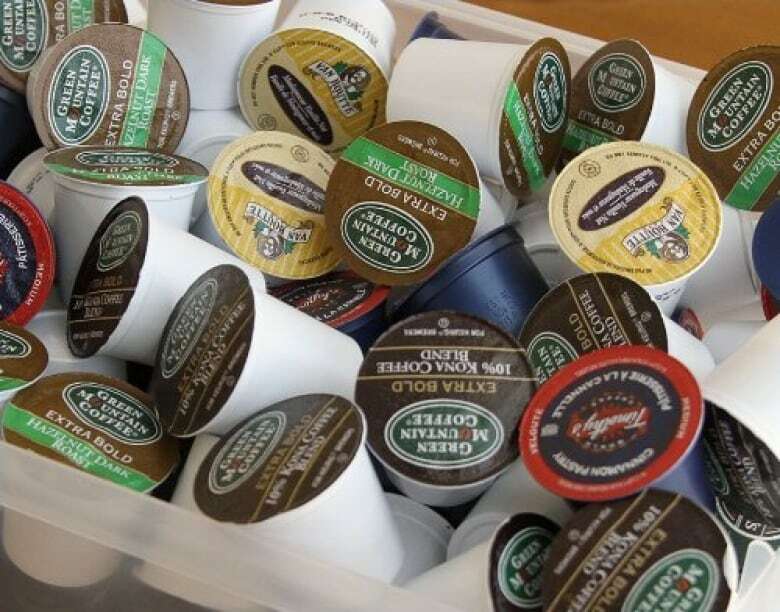 For its part, Keurig Green Mountain pledges to have fully recyclable K-Cups by 2020, but by the company's own admission, the cups aren't recyclable at the moment. Sylvan rejects the notion that K-Cups could ever be recyclable. "I don't care what Green Mountain says. You can't recycle that package," Sylvan says. He says he doesn't begrudge the company for its success, or for wanting to make money, but he does question consumers' slavish devotion to the things. The company's latest product, the Keurig 2.0, which allows users to use pods to make larger cups and pots of coffee, is a great example of that. "I stopped when I was walking in the grocery store aisle and I said, 'What is that?'" Sylvan recalls. "I picked it up and looked at it and said, 'You have to be kidding me.' Now they want you to make a pot of coffee with a Keurig machine." He doubts the machines will ever be banned, since everyone who has bought one depends on the pods' existence. But he says consumers need to take a long hard look at their decisions, and make sure their decision to buy products is really worth their while in the long run. "From a personal standpoint, it saves 20 seconds of your day," he says. "What's that worth?" "There's other ways to do it, but they're not exploring other ways to do it," he says. "They're going to make those little plastic cups forever, because they can't think outside the box." "You can stick your head in the sand and ignore it, or you can address it from an engineering standpoint."